No promises on whether I'm going to be doing these this year, but I got the urge to play around a bit with spreadsheets tonight. The Reds begin their interleague schedule tomorrow as they travel to Chicago to take on the White Sox. The White Sox shelled out some money this offseason in hopes of becoming relevant once again, but they're off to a pretty brutal start. Their starters have struggled, but their position players have been absolutely miserable. At present, by FanGraphs' reckoning, they are the only team whose position players have posted sub-replacement performance thus far. 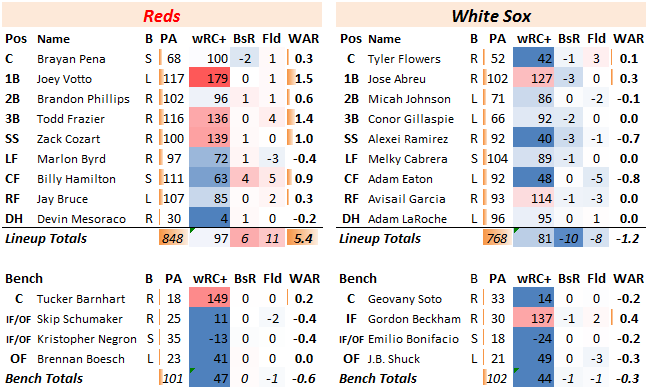 The Reds haven't exactly been an offensive powerhouse thus far, but at least they've shown decent power. The White Sox basically just haven't hit, and on top of that have been bad on the basepaths and in the field. This is not what their front office had hoped to see when they brought in Melky Cabrera, David Robinson, and Adam LaRoche this offseason. The only bright spot has been the bullpen, which has been as advertised. 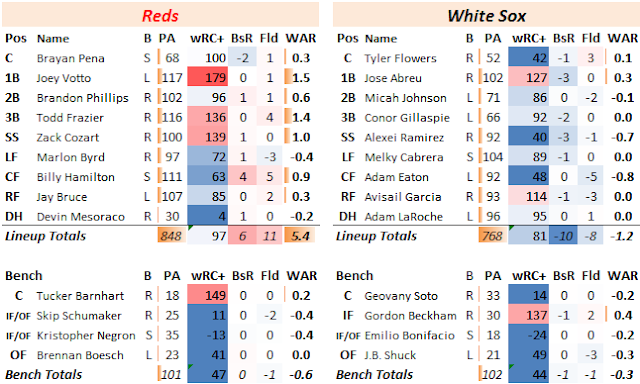 The Reds are still hovering around .500, as they were more or less projected to do this season. 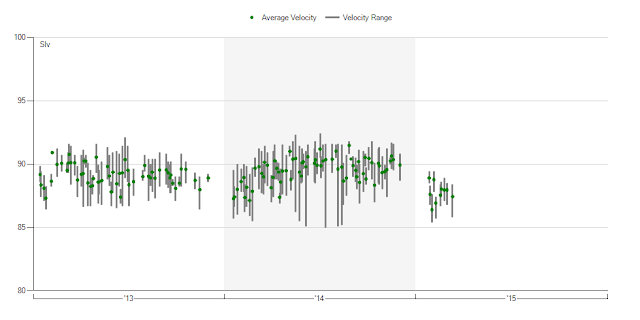 Starting pitching has been strong, position players are hitting ok-ish and doing everything else well. And the bullpen, while the defense-independent stats suggest it might get better, has been awful. But you all knew that. Hopefully they can take advantage of the struggling White Sox and pick up a few more wins. As Steve Mancuso speculated a few weeks back, Devin Mesoraco seems likely to get significant time in the coming month as the Reds' DH. This may well be the extent of the consistent action that he can get this season, but it will be fun to see him slotted into the lineup once again....It seems worth noting that Brandon Phillips is BABIPing .349 (career .293) to go with that 96 wRC+. I feel like I've seen him get a ton of little flare hits or, like in Wednesday's game, an ultra-weakly hit ground ball RBI. His hard-hit ball percentage isn't as low as I would have expected, but it is down from his career average (23% this year vs. 29% career)....Given his offensive struggles, I was surprised to see that FanGraphs has Billy Hamilton almost all the way to 1 WAR already. That's entirely driven by his baserunning and fielding numbers thus far. He is unquestionably fun to watch play defense. Jason Marquis' start to the season has been pretty interesting. He's not leading the league in strikeouts anymore, but he still has very impressive strikeout totals and improving ground ball rates (his traditional calling card). It will be interesting to see whether hitters keep chasing his splitter......I'm less worried about Michael Lorenzen's home run rate because his ground ball rate has been solid. I'm worried about his fairly poor strikeout rate and all of those walks. As hard as he throws, Lorenzen's minor league strikeout numbers are not particularly impressive. To be fair, of course, he has moved very, very quickly. The most interesting of the White Sox' starters thus far is unquestionably top prospect Carlos Rodon, who will be making only his second start. He was last year's third overall pick, and has only thrown a handful of professional innings. Kiley McDaniel's scouting report shows that he throws hard from the left side, with an even better slider, and (though he hasn't really used it yet) a quality change-up. He was wild and lucky in his first start, but he's got talent....The other guys, at least so far, have been utterly shelled. 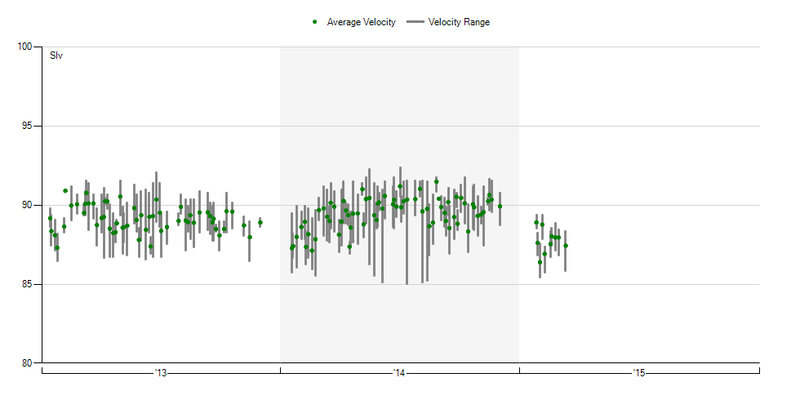 David Robertson has been even better than Aroldis Chapman thus far. Of course, the biggest mark on Chapman were all of those walks earlier this week. The surprising thing to me is that Robertson hasn't really been used in particularly high leverage situations thus far. Maybe that's what happens when your team is almost never in the lead!.....Scott Carroll is a former Reds 3rd-round selection and was an older college player. He was released in 2012 after an up and down minor league career that included a PED suspension (hCG, which is often taken to prevent testicular atrophy when taking androgens). He got some decent inning totals last year as a part-timer in the White Sox rotation, though didn't throw particularly well.